Private investigators are often called on when the police can't help or more research needs to be done, and they're no stranger to frantic phone calls from individuals who are being stalked, harassed, and frightened by unknown individuals. One of the founders of Bosco Legal Services recently had a scare that hit close to home, when a threatening phone call disrupted his family. This gave the company first hand insight into exactly how valuable a private investigator's services are for safety and piece of mind. It was just an average morning. Jeremiah Jones' (one of the co-founders of Bosco Legal Services) wife was driving the couple's oldest daughter to school when they received a disturbing phone call. The man on the other line called her by name and told her he was going to come into her bedroom, then into their eldest daughter's room, and then into their middle daughter's room, referencing each of them by name. Jones' wife immediately hung up the phone and tried to call her husband, who wasn't available. She turned around and drove home to make sure everything and everyone was okay, and arrived distraught and frazzled, understandably so. The police were called, took down notes, and tried calling the number, but that was all they could do. The man on the other line called her by name and told her he was going to come into her bedroom, then into their eldest daughter's room, and then into their middle daughter's room, referencing each of them by name. "When he left, we didn't have any warm and fuzzy feelings that the sheriff's department was going to do anything else for us," Jones wrote in a blogpost about the experience. "It dawned on me at that point, that if like most people I had to wait for the police to investigate what happened, I may never have closure. Although this was a very real and scary situation for my family, with the limited resources that the police have and since no one was physically hurt, this was not high on their priority list." Jones said that his children were terrified, frightened of being in the house but too scared to leave. Jones says that this gave him a new perspective of what many of his clients are experiencing, and decided to use the resources he had to move forward with the case. "Fortunately, by nature of my profession, I was able to get ahold of the head of our investigations department, who also happens to be my very protective brother, and I had him start the process of figuring out who had called and threatened my family," Jones wrote. The initial searches revealed a phone number that belonged to an individual they had never heard of, and most of the information was several months old, as it often is. Jones wasn't certain the information was accurate. So, Jones' brother went a different route, reaching out to a source that had access to real time phone information. That source was able to reveal not only that this phone number had been activated only two days earlier, but also the name and address of the registered owner. Surprisingly, Jones recognized the name. The phone number was registered to someone who the family knew well. While this would generally seem alarming, fortunately it turned out to be a prank gone too far. "It turns out the call came from a teenager that had simply gotten carried away with a prank phone call and it was nothing too serious," Jones said. "The perpetrator was dealt with in an appropriate manner, but thankfully nobody was ever in any real danger." 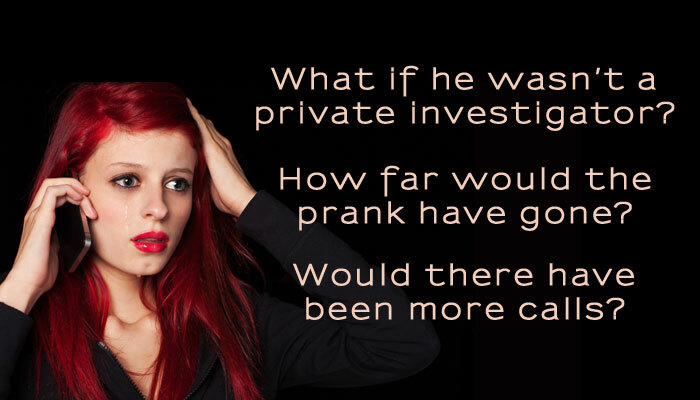 But what if Jones wasn't a private investigator? What if his only option had been to rely on the police, and deal with an ongoing sense of danger? How far would the prank have gone? Would there have been more phone calls? "If we had not used a private investigator to help us figure out who it was however, my family would have been in fear for days, weeks, or maybe even months," Jones said. "As I have reflected on this event over and over in my mind, it gave me a new appreciation for what it is that we do for our clients on a daily basis and the effort that ours investigators make. When your family is in the middle of a difficult situation like this, you simply can’t put a price tag on having peace of mind and resolution."